One reason I’ve followed the whole “millenials leaving the church” discussion is because it’s directly related to a central theme of my book. Many of the responses to the millennial debate have either focused on personality characteristics or life cycle issues. The former argue that millennials are entitled and narcissistic, so they are unhappy because the church doesn’t meet their unique needs. The latter argue that all young people are estranged from religion but tend to return once they’ve married and had children. I believe both of these positions have missed the central question surrounding millennials — that they’ve grown up in a remarkably different culture than earlier age cohorts. The confluence of their cultural location with their questions about faith suggest the need for real changes in Christian education. The third chapter of the book addresses the changes social scientists have documented in recent years about today’s young adults. The chapter has informed much of what I’ve written in this blog. The first entry attempted to argue why these changes are important to Christian Higher education. I won’t repeat all of the argument here: today’s young adults are marrying later, have a less traditional commitment to institutions, are affected by Moral Therapeutic Deism, and have remained connected with diverse groups of others. The culture they grew up in is what David Kinnaman calls “Discontinuously Different”. They were eight on Septermber 11th; they heard over and over that the world had changed. They grew up not only seeing gay characters on television, but they have known gay students throughout their schooling. They see science as a significant part of modern life and don’t see it as a threat. The most important issue is that they’ve grown up in a culture where matters of faith were things that one had to nuance. Not everyone around (except in some Christian high schools) assumed biblical authority or religious orthodoxy as a given. That’s the significance of the chart above from Putnam and Campbell’s American Grace. It shows the percentage of 18-29 year olds who are identify as evangelicals or as religious nones. 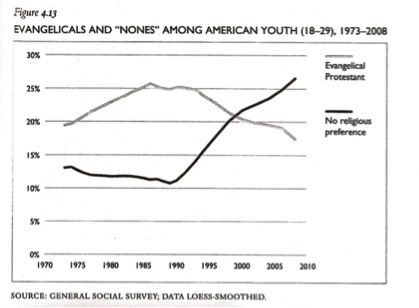 In a relatively short twenty years, the relative strength of evangelicals gave way to nones. In 1995, evangelicals had a 7% advantage over nones. By 2010, nones were up by 10%. Millennials with faith commitments are looking for ways of engaging their questions without retreating from the broader culture. This is why the Barna research centers on concerns about science, doubt, homosexuality, cultural acceptance, and power. Our students are struggling to stay engaged with their culture while maintaining their Christian voice. If Christian universities find the means of adjusting to these students’ concerns, we will play a central role in the culture unlike anything we’ve ever dreamed. If, on the other hand, we ignore these changes we’ll wake up one day irrelevant to the broader cultural dynamics. « First Step: What Am I Doing Here?